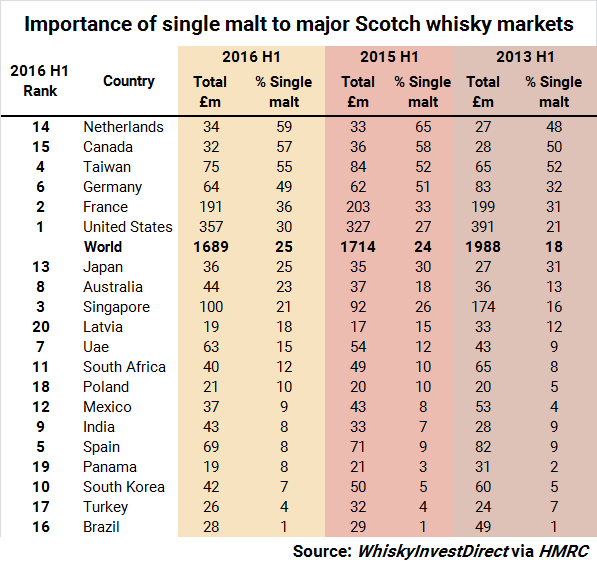 THE RECOVERY in worldwide exports of Scotch whisky is taking different forms across the globe, writes Leon Kuebler for WhiskyInvestDirect. After three years of decline, exports of Scotch whisky across the globe are beginning to show improvement. Official figures from HMRC, first reported on by WhiskyInvestDirect, show that exports of Scotch by volume were higher in the first half of 2016 than in the previous year. While the value of Scotch exports were down slightly year-on-year, the rate of decline was far lower than in H1 2015 (-3.1%) and H1 2014 (-11%). Although demand for Scotch is starting to recover worldwide, separate trends are emerging in different markets. At a glance, one development is clear – and, on the face of it, counter-intuitive – namely, that exports to the United States, the largest market by value for Scotch, are growing in value but decreasing in volume. Meanwhile, exports to France, Scotch’s second most valuable market, have done precisely the opposite, as the increased amount of Scotch imported in 2016 to date has failed to prevent a real decline in the value of such shipments. Currency factors offer a partial explanation as to why people in the United States were able to spend more on Scotch, despite drinking less. According to the Bank of England’s spot exchange rate, 1 USD averaged 0.656 GBP in H1 2015, but the same Dollar’s average value was 0.698 GBP in H1 of this year. This increase in the value of the Dollar against the Pound by an average of 6.4% effectively made Scotch cheaper in the United States this year to date. Yet this explanation does not work for France. The average value of 1 Euro against the Pound also rose by 6.4% in H1 2016 against H1 2015. Other Eurozone countries, such as Germany and the Netherlands, did not follow the same path, as both countries saw their imports of Scotch rise in both volume and value terms. However, there is another major Eurozone destination for Scotch that has shown the same trend – Spain. Like France, Spain, Scotch’s 5th largest market by value, and the Eurozone’s fourth largest economy, has experienced slow economic growth in recent years. In Q2 of 2016, both France and Spain posted lower-than-expected growth rates. France actually underperformed compared to the Eurozone as a whole, although Spain performed better. As we suggested in our review of the Q1 2016 data, it appears that France and Spain are no longer suffering from weakening demand. Instead, while Scotch remains popular in each market, local economic conditions have currently caused consumers to opt for a less-expensive Scotch. More broadly, a second divide between major Scotch markets is emerging – and it revolves around single malt whisky. Historically, blended Scotch, which is generally made from malt and grain whiskies from a variety of distilleries, has been the bread-and-butter of the industry. By contrast, in most places around the globe, single malt was something of a well-kept secret. At the beginning of the 21st century, exports of single malt and blended malt combined only accounted for 5% of total exports by volume, and 11% of the overall value of these shipments. If single malt was largely unknown at the start of the third millennium, this is certainly no longer the case. In every year since 2010, when HMRC began recording single malt as a separate category of Scotch, its’ value share of total worldwide Scotch exports has increased. Today, one in every four of the Pounds Sterling generated by Scotch worldwide is from single malt. Yet the growth of single malt Scotch has, surprisingly, been a relatively local phenomenon. As of the first half of 2016, the market share of single malt as a percentage of all Scotch imports only exceeded the world average in six of the top 20 Scotch whisky markets. In fact, the rise of single malt whisky has essentially arisen in a group of Western European countries, along with Canada and Taiwan. As of H1 2016, outside of the markets shown in the table above, the other countries where single malts form the majority of Scotch imports are Sweden (52%), Italy (55%) and Austria, where a staggering 81% of all Scotch is sold as single malt. However, while these three countries are not insignificant markets; combined, they only accounted for 1.9% of worldwide Scotch exports in this year to date. Scotch whisky is seen as a luxury product around the globe, and in many developed markets single malt is seen – and priced – as the most ‘premium’ type of Scotch. For this reason, it is not surprising that it has experienced disproportionate popularity in developed markets. Nevertheless, single malt’s market share of Scotch imports still remains comparatively small in most countries. The majority of Scotch sold in the two major markets, the United States and France, is still blended (at least 66% and 58% respectively). This is also true of key emerging markets for Scotch, such as Singapore, the United Arab Emirates and Brazil. 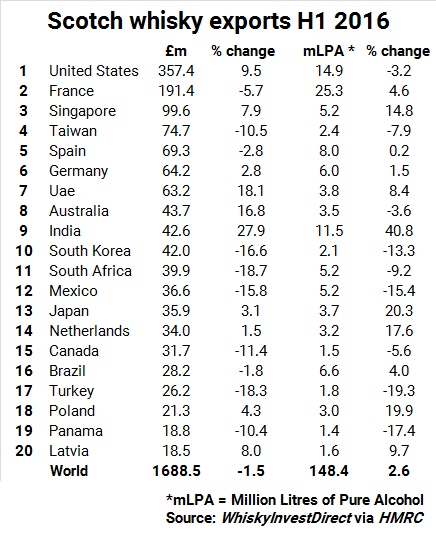 The questionable importance of single malt Scotch’s performance in emerging markets for is best shown by India. India is the world’s largest whisky market, but Scotch only accounts for 2m of the 180m cases of whisky sold in India. In the first half of this year, the value of Scotch sent to India rose by 28% in value and 40% in volume compared to H1 2015. Yet the value of single malt exports to India in H1 2016 is 22% lower than those five years earlier, in H1 2011. Over the same five-year time period, sales of blended whisky have increased by 63%. Should exports of Scotch continue to improve over the coming months, then the recovery is unlikely to take the same form across the globe. The days when blends reigned supreme in every country are over. But in most countries, it is blended Scotch, not single malt, which is still king.